A not so fun ride the the hospital in an ambulance and a bunch of x-rays later - nothing was broken. Just a very sore neck (from the seat belt) very sore bruised ribs (from the steering wheel) and two sore knees from hitting the dash. Hit the dash so hard the paint from the dash was impregnated into my paints. Going down hill into a tricky double right hand turn I hit a patch of black ice when trying to slow down for the second turn. In 2 seconds it was all over. Wheel hoped into the left lane while trying to make the turn and just wouldn't ya know it - an adult services bus was coming around the bend. OUCH! First accident in 20 years and I do hope never to experience this again. Grateful to be alive. Still pretty sore in my chest but I am okay. Oh my God what a terrible thing to endure. Those are pretty graphic pictures. Thank God you were wearing the belt and that you're OK. This community nearly lost a great member. glad your ok and hopefully that doesnt happen again! 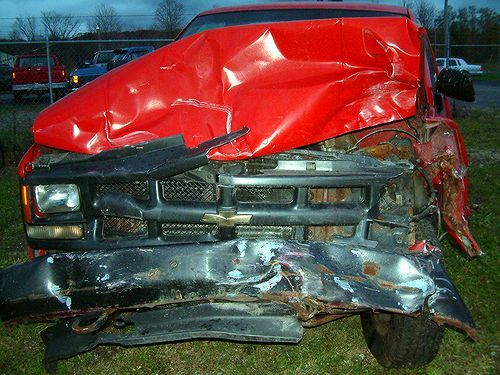 Man I was just looking at those pics again... What a great job that old Chevy did protecting you. It crumpled up just right to absorb all that energy and it looks like the passenger compartment was completely intact. Did it transfer energy around you and damage the backend too? OL Chevy's and OL men are tough!. Did you have your seat belts on Frank? Glad you were only banged around a little. Ouch! Glad your ok Frank. My friend got rear ended by a semi, and the accident caused an 8 car pileup. 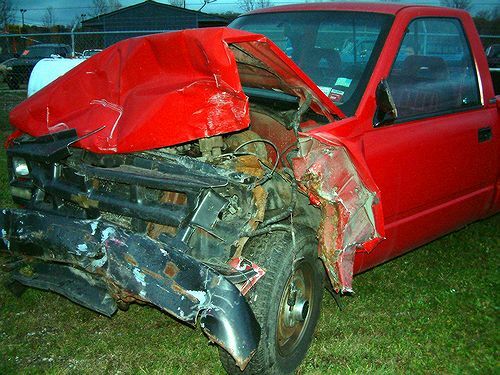 It was an F-150 and looked worse that your truck did after the accident, but he just had some whiplash. I damn near bought one just 'cause of that. Connie, if I did not have my seat belt on I may not be here typing this. I came close to the windshield with it on. I bent the steering wheel a couple inches and the wheel is very heavy duty. My chest still hurts quite well some 11 days later. You got tired of the electrical problems -- in particular, the faulty ignition switch! Please be honest, for once! That's what I drive, wish it was better on gas! My Impala gets slightly better than 20mpg, but it would probably be better if I didn't get so ticked off by slow drivers, heh. My friend got another F-150, actually, and I think he said he gets somewhere between 14 and 16 mpg. But that's almost worth it to know that you can get rear-ended by a semi and not be pancaked.